In December, I invited you to join me in a unique project to bring beauty and hope to survivors of domestic violence. I wanted to write an update and express my deep gratitude to all who participated in sending handwoven kitchen towels to the women who will be moving into the apartments of Dina’s Dwellings. These women and their children have been through more than I can imagine. I believe that a handwoven towel can help unravel the negative messages they have absorbed from the abuse, and restore some beauty and hope to their lives. It has meant a lot to me to have a community send these towels as housewarming gifts. Dina’s Dwellings is building ten affordable and permanent apartments for survivors of domestic violence. I wanted each woman to receive at least one towel. Uncertain about what kind of response I’d receive, I set aside ten towels. However, your generous donations totaled 12.67 towels, so I selected ten more towels to send. 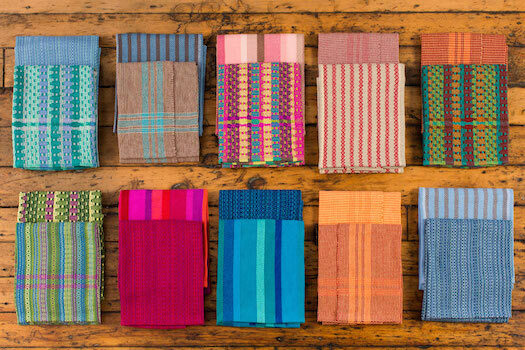 I’ve enjoyed putting together pairs of towels that are different, yet have a similar color palette. I know that everyone has different color preferences, so I will write a note encouraging the women to trade towels so that they each get colors that speak to them. I have been so moved by the notes you’ve asked me to include in the cards that will accompany these towels. Words of respect for the journey these women have been on. Stories from your own lives. Expressions of love, support and encouragement. For example, Erika wrote: Wishing you peace and comfort in your new home. This towel is meant to bring a touch of homemade nurturing to you. Let it be a reminder of how you are loved. Thank you for your thoughtful wishes for a new beginning and your belief in these women. I believe they will be touched, as I have been. Thank you for your generosity that makes it possible for me to send 20 towels. I am delighted that these housewarming towels will be coming from people across the US, Canada and England, who understand what it means to the women of Dina’s Dwellings to have a home. Thank you as well for spreading the word by sharing this project on social media. I’m grateful to be part of such a caring community. Thank you. P.S. After several construction delays on Dina’s Dwellings, a ribbon cutting ceremony is now scheduled for Thursday, February 11th, so it’s not too late to donate. If you’d like to donate a towel or a portion of one, please click here by midnight, Friday, January 29th.